Just 5.7 Km away from Swaraj Round, Immerse in tranquility. Salim Associates Builders & Developers is synonymous with quality residential and commercial spaces. With our flagship brand, the Nandanam series of flats & villas, we have changed the real estate scene in Guruvayur & Thrissur. Haven is an highly affordable apartment project in Thrissur with all basic amenities. Invest in Serviced Apartments at Guruvayur. A Real Estate Investment that earns you REAL PROFIT! 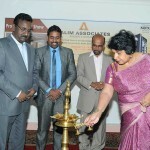 SALIM ASSOCIATES, GURUVAYUR INK THEIR NAME IN MUSCAT. 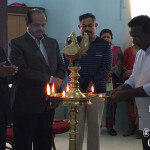 Salim Associates, one of the leading Builders and Developers in Kerala, India has organized a three day Exclusive Expo of their Hotel Apartment Project in Guruvayur and “Customized Villas” in Thrissur at the Haffa House Hotel, Al Buraimai Hall from Thursday 14.1.2016 to Saturday 16.1.2016. 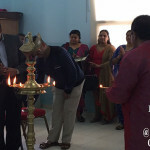 The Road Show of their project in Oman was officially inaugurated by Madam Neelu Rohra, Second Secretary (Community Welfare), Embassy of India by lighting the traditional Kerala Lamp at 7 pm, at the Haffa House Al Buraimi Hall. 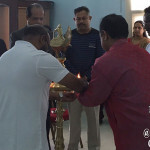 Madam Neelu in her opening address wished Salim Associates every success in their new Hotel Apartment Project and expressed the importance of investment in the real estate market especially in the Holy City of Guruvayur. While welcoming the Guest and the audience, Mr. R.A. Salim, Managing Director of Salim Associates explained their 27 years of successful growth in the property market. Their current project, Nandanam Habitat Hotel Apartment with 4 Star Hotel facilities offers a unique opportunity to the investor to get a monthly income by renting out the apartment on a daily rental basis and it will definitely turns out a continuous source of income to the investors who own this Hotel Apartment Project, considering the large number of yearly foot fall of Guruvayur pilgrims. These apartments provides the 4 star facilities including, Swimming Pool, Health Club, Snooker Club, Wedding Hall, Multi Cuisine Restaurant on the roof top and such unique facilities to you. Additionally, you can have a relaxed holiday in your own hotel premises with these facilities, when you visit our Holy City Guruvayur. Said Mr. Salim. Mr. Dijesh, marketing in charge in his Vote of Thanks, expressed elaborately about the unique features of the hotel projects and requested the prospective investors to utilize this opportunity which is at its right time to invest. Mr. Dijesh, a flawless orator, briefed the 27 years of Salim Associates success story and the name and fame it has grabbed among its NRI clients from UAE, Bahrain, Qatar, Oman and other Middle East countries. 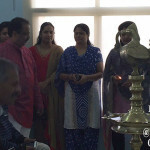 The ceremony was also witnessed by some of its already existing happy customers from Muscat. Mr. Dijesh informed that the Salim Associates is planning to proceed with the road show of their projects to the whole Middle East and later on to South East Asian countries, European countries and American Continent as well. 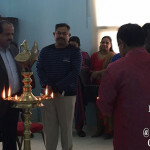 The welcome ceremony to the Guest, by Mrs. Hema Malini and group in the traditional Keralite Attire added more colours to the inauguration, said Mr. Dijesh. 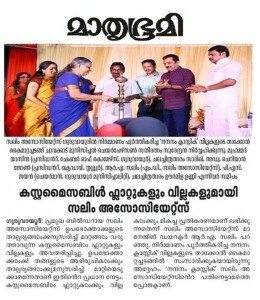 Mr. Salim expressed his whole hearted appreciation to the Muscat Keralites and requested them to invest right now, for a bright stay back home, in Kerala, India. Salim Associates is organising property show at Haffa House Hotel Muscat, Oman on 14, 15 & 16th January 2016, from 9.30 am to 10.00 pm. This is a golden opportunity for Oman NRI to invest on the booming real estate market in Thrissur & Guruvayur. 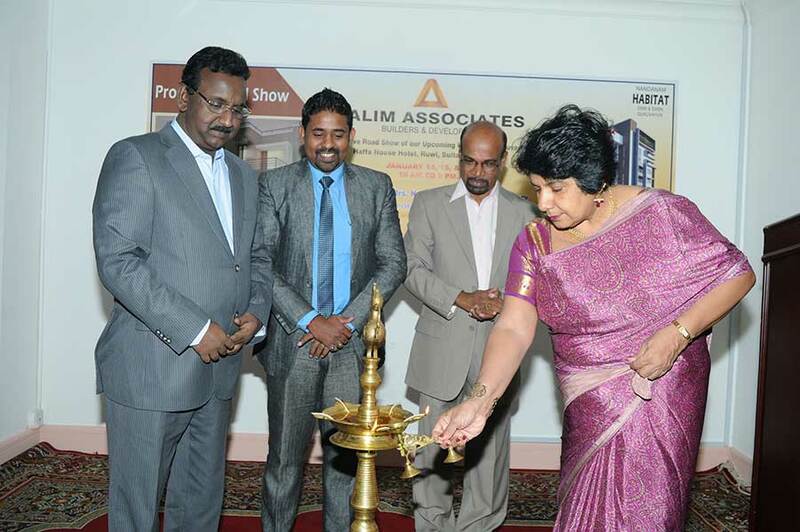 Salim Associates is organising property expo at Keraleeya Samajam, Bahrain on 16, 17 & 19th December 2015. 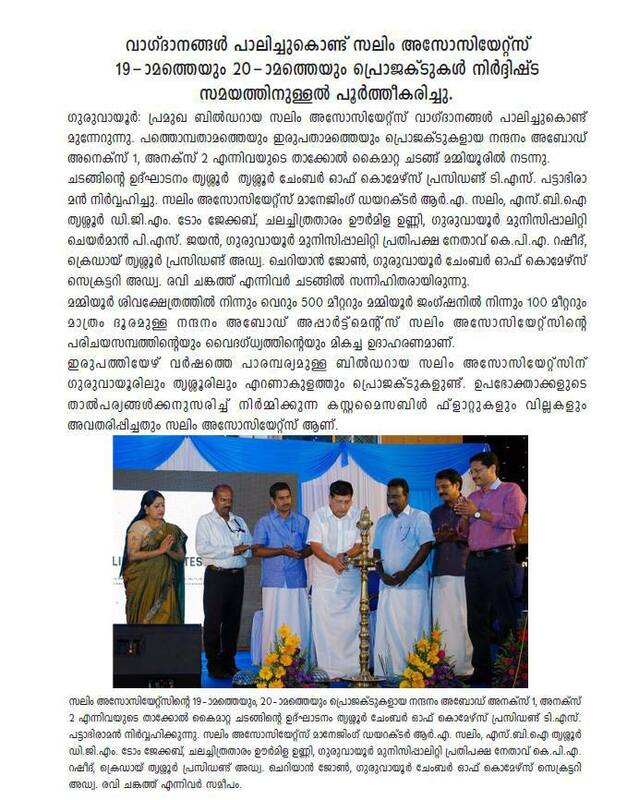 This is a golden opportunity for Bahrain NRI to invest on the booming real estate market in Thrissur & Guruvayur. Salim Assoicates recieves "Best Managed Company" Award from Mr. Abdul Rabb, Honourable Minister for Education, Government of Kerala. 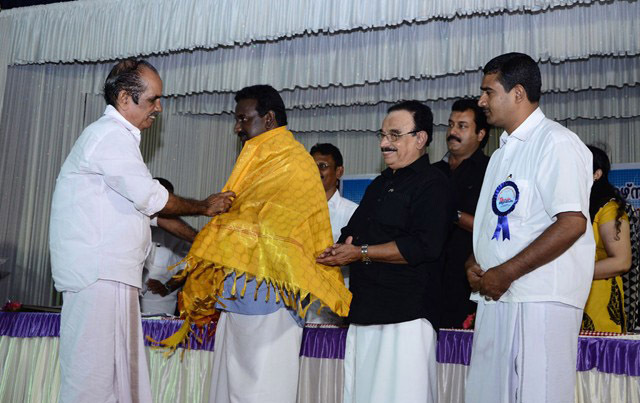 Salim Assoicates has been awarded the "Best Managed Company" title at the 15th annual meeting of the Chamber of Commerce, Guruvayur held at the Town Hall on Cctober 13, 2012. 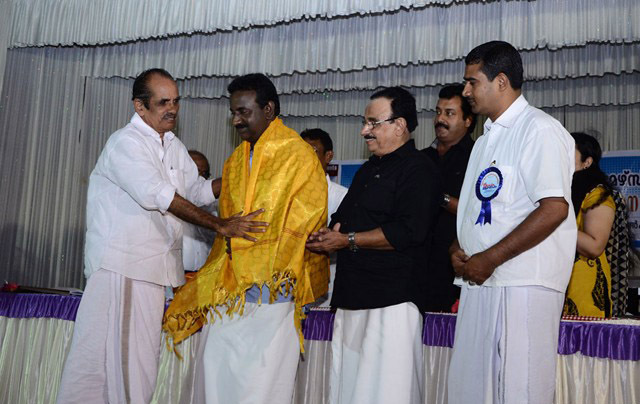 The award was presented by Mr. Abdul Rabb, Honourable Minister for Education, Government of Kerala to Mr. Salim, Managing Director of Salim Associates. 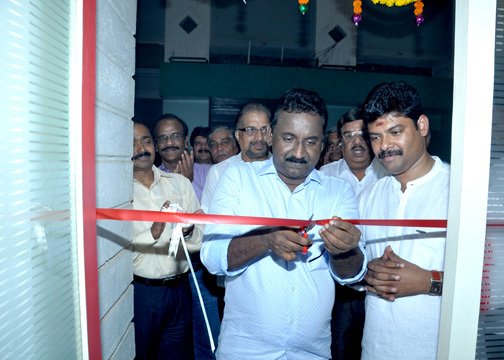 S&A Builders announces the launch of Nandanam Plaza. 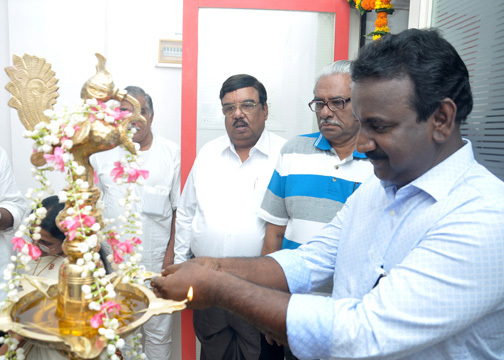 Nandanam Abode Apartments: Construction on schedule. Booking continues.